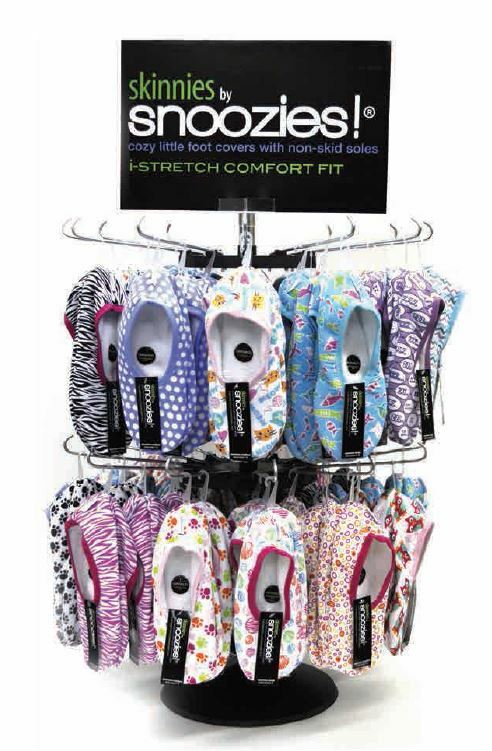 Our new snoozies!® counter display fits on top of any counter or other display surface and has 2 tiers with 12 hooks per tier. Each tier spins so customers can see all styles on each tier. Each tier will hold either 36 pair of classic snoozies (1 case/collection with 3 pair/hook) or up to 72 pair per tier of our skinnies® by snoozies or our other ballerina styles snoozies! (2 cases/collections with 6 pair per hook). Round black plastic base. snoozies!® header sign included with display.